Etihad Airways, the national airline of the United Arab Emirates, and Universal Pictures today unveiled the luxury Fast & Furious 777 airliner at Los Angeles International Airport (LAX). 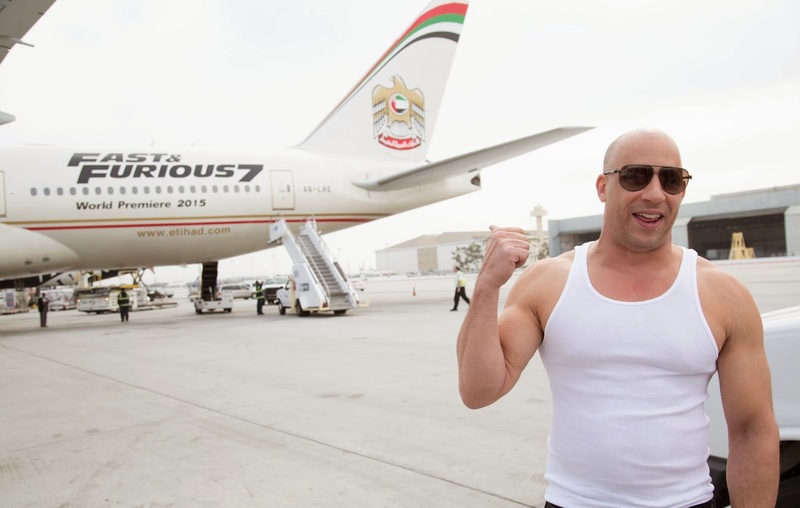 Actor/producer Vin Diesel was on hand as Etihad Airways Flight 171 arrived from Abu Dhabi to kick off the global junket and world premiere of Furious 7. The film arrives in theaters on April 3.As the United Arab Emirates offered an opportunity to inject striking elements and locales into the series’ mythology, Abu Dhabi became a key location for the Furious 7 production. Over the course of two weeks in April 2014, the team lensed in areas outside Abu Dhabi in the Liwa Desert, as well as in the city center at such locations as the Sheikh Zayed Grand Mosque, Emirates Palace hotel, the Yas Marina F1 race circuit and the Etihad Towers. Considering Abu Dhabi’s striking skyline—one accentuated with stunning architectural achievements—aerial shots of the skyscrapers were mandatory. Representing a welcome first for the franchise, the Fast & Furious 777 will fly the direct route between Abu Dhabi and Los Angeles, which Etihad Airways opened in June 2014. The airline is also a sponsor of the Furious 7 world premiere, which takes place in Los Angeles on April 1.